Dr. John Lenczowski’s opening ends at 13:51. JOHN LENCZOWSKI (JL), PRESIDENT AND FOUNDER OF THE INSTITUTE OF WORLD POLITICS IN WASHINGTON, D.C. OPENED THE EVENT AT JOHN’S ISLAND CLUB IN VERO BEACH, FLA.
JL: Good afternoon, ladies and gentlemen. It’s a great pleasure to be here with you all at John’s Island again. I just want to thank Peter Brinkerhof and Barry Sullivan for their wonderful hosting of this event, their hospitality to me and my colleagues, and so much of what they have done […] Thank you so much for you who are here for all you’ve done; for our mission at IWP—the Institute of World Politics. For those of you who are new to the Institute, I wanted just to give you a brief introduction about our mission. I once served in government in the State Department and the National Security Council, and I discovered that all sorts of people were doing jobs for which I thought they were inadequately prepared. And, I considered myself to be in that category in some fields, as well. I had been teaching at Georgetown. I had been teaching there for about 14 years, and I had tried to get Georgetown to adapt their curriculum accordingly, and they told me that I would have an academic turf war if I tried to add new courses in certain fields—particularly the different arts of statecraft. And, so, that’s what prompted me to start IWP about 28 years ago. We have simple mission: to help develop leaders, who have a sound understanding of international realities; the ethical conduct of the different parts of statecraft; with knowledge and appreciation of the founding principles of the American political economy and the Western moral tradition. It’s a four-part mission. International realities, what does that mean? Understanding our enemies on their own terms. Not simply by mirror-imaging, thinking that they’re just like us. Understanding how they behave. Understand their history. Understand all of the fast balls and curve balls and knuckle balls in the world. Particularly behavior that exceeds the bounds of normal, accepted diplomatic practice. And we seem to have that kind of thing all of the time. Whether it’s terrorism, whether it’s treaty violations, genocide, mass murder in failing states, whatever it may be, strategic deception; propaganda; perceptions management—and you know one of the problems of understanding the complexities of the world, it’s sometimes hard to know if you’re perceiving reality directly. And, there are all sorts of impediments. I mentioned mirror-imaging; I mentioned propaganda; deception; fake news disinformation; covert influence operations; finally these things made the news! We’ve been teaching our students about these things for the last quarter-century. Then there are all sorts of utopian thinking out there. Particularly, in international affairs. Some people think that if we just had a few more UN-type organizations; that if we had just a little bit better international law, and some more dialog, gee, we’d all live in peace together. Some people refuse to acknowledge the existence of evil in the world. Some people think that you can march into Iraq and change it into a democracy overnight—as if culture doesn’t exist. As if the habits and the customs and the mentality developed over decades and centuries don’t exist. Some people think that if we just get out of the world’s face, get out of people’s faces, and withdrawal from the world, that they’ll stop hating us, and all of the sudden, we’ll be at peace. And, then there are some people who think that we can run foreign policy according to the national interest—the vital national interest—without interference from political and humanitarian considerations. Well, I think that’s another variant of utopianism. Because, you’re not going to get rid of (hopefully) the moral sensibilities and humanitarian chords in the human heart—and in the American heart, particularly. So, there are all sorts of obstacles. Then, if you don’t study some of these things. If you don’t study strategic deception and disinformation, if you don’t understand how your perceptions were managed by propaganda ministries, and KGB trolls, and bots, and all of the other things that they’re doing to try and influence us—and it isn’t just the Russians: it’s the Iranians, it’s the Chinese—this is a big contest in the information battlespace: to shape perceptions and attitudes. Then, of course, there are—so how do you deal with it all? These are the arts of statecraft; the instruments of national power: military, diplomatic, peacemaking, public diplomacy—which means relations with people—and not just governments (and that means everything from cultural diplomacy, which our government does, but which it totally neglects in spite of the fact that it is of strategic importance, and there is information policy—international broadcasting). If, if you were to ask, during the Cold War, the author Aleksandr Solzhenitsyn, said that, “our international broadcasters, the voice of America, Radio Free Europe, and Radio Liberty, were the most powerful weapons we possessed in the Cold War.” Scratch your favorite policy expert and ask him, if he can explain what Solzhenitsyn meant. And, why he could say, that radio stations were the most powerful weapon we had in the Cold War? The fact is that they were decisive in the victory over Communism. But, the foreign policy establishment in Washington, in my view, does not understand this, and the academic preparation of the people who man it, does not consider these conventions of statecraft. IWP, to my knowledge, is the only school in the nation that systematically teaches its students how to do this. Which is one reason why the [United States] Army discovered us when they tried to do counterinsurgency warfare, which involved things like winning the hearts-and-minds, and not just killing people, in order to win these wars we were engaged in. So, [the Army] would send their colonels and strategists to us in lieu of going to War College. We teach our students about American founding principles. Why? Because I don’t think that they can effectively represent or defend, a country whose system you neither understand nor particularly like. And, there has been a precipitous decline in the study of American history and government in this country, it’s become a pandemic, I think to the great detriment of our common community. Finally, we teach Western moral philosophy and applied ethics. We teach students how to use power like liberty can be abused. We want our students to use power ethically, prudently, responsibly, and that means they have to have contemplated prudential moral reasoning is and how it’s applied to the use of power. We want to elevate the quotient of moral leadership in Washington, which has gotten, in my opinion, more corrupt in the 45 years that I’ve live in that town. Anyway, that’s our mission, I want to thank again those of you who have been so generous to us. I’d like to invite those you who are new to our cause to take a look at the literature that we have on the tables. We have our annual reports on the table, and on the back over there. And, so that’s basically what we’re up to and I just want to thank you all again. You honor us with your presence. We at IWP, have a unique student body and faculty. Our faculty are almost all scholar-practitioners. They have done what they teach. We have ambassadors, intelligence officers, military officers, all sorts of people who’ve been involved in democracy-building, foreign assistance, all sorts of different aspects of statecraft. And, we have a student body, half of whom are recent college grads and the other half who are mid-career professionals—from all over the place. We have five masters programs. And, just this last Fall, we launched—we got approved—our first doctoral program. A doctorate of statecraft and national security. It’s a professional doctorate, designed for people moving into the profession, rather than into the academic world. And, we just launched it in January. And, we admitted two students—actually three. One has deferred, two have started. We are going to admit more in the Fall. And, you’re going to hear today from one of them, Brandon Weichert. Brandon is an extraordinary young man, who has a number of years of experience in Washington under his belt. He worked for a Congressional staff, he has been active as an author, journalist, he astarted his own website, called The Weichert Report, he works as a contributor to The American Spectator, and at American Greatness. He has contributed to many academic journals. He distinguished himself at IWP in his Master’s degree work. And, he’s a natural to continue on in his doctorate. He has done cutting-edge work in the field of space policy, all around the global competition—and you’re going to be hearing from him about this subject—fascinating subject, and we’re really proud of Brandon. Not only of what he’s done, but what he will continue to do in the future. Brandon, the floor is all yours. BW: Thank you, John, and I hope I can live up to that. I just want to say one, quick thing about Dr. Lenczowski. He’s very modest, but he is one of the architects of the Reagan era strategy for defeating the Soviet Union. His time on the [Reagan] National Security Council is very well known and he is someone—I—am very proud to know helped to defeat the Soviet scourge. So, that I don’t have to live in the period that is yet another competition of Communist vs. Capitalist. But, today, I’m going to talk about space policy. When we think of space policy, we think of NASA. We think of some of the more interesting, maybe esoteric ideas of space exploration, and taking the really cool pictures of space [from the Hubble Telescope], what we don’t realize, as Dr. Lenczowski mentioned, is that it is a budding arena of strategic competition. Now, back in the Cold War, it was still a new area; very expensive—the technology wasn’t really advanced, so competition between the Soviets and the Americans was kept relatively muted. Obviously, the Space Race was a notable exception. But, we didn’t have an actual shooting war in space. We are living in a time today when, particularly China, has a capability—and they are increasing their capabilities—to threaten our very vital systems in space—parotuclarly our satellites. So, what I’d like to talk about is how we counter the Chinese strategic threat in space. And, I think a similar concept can be brought into the 21st century vis-à-vis space. I like to say, “Who rules the air, commands low-earth orbit who rules low-earth orbit commands space and who rules space controls the world.” Geopolitics has returned. History has returned. And, it is in the competition of places like space and cyber where we are seeing some of the most dangerous things occurring, and most people are not even aware of that. Most people are oblivious—maybe happily so. But, the ability to threaten our space architecture is the ability to shut down modern society. If you pulled cash out of the ATM any time recently, your signals likely traveled through space. They were relayed through a satellite overhead. If you got gas and you used your ATM card, same thing. Imagine the ability to disrupt our society by knocking out a handful of satellites. Creating chaos here. Susan Gordon, who is currently Principal Deputy Director for National Intelligence, she said, back in February  at a conference [in Washington, D.C.]: “China has the best politically-supported, and best financially-resourced foreign space program we’ve seen in years.” According to Dean Cheng, at Heritage Foundation—I saw part of this testimony when he worked on the Hill—he said, “Space systems are judged to have provided 70 percent of American battlefield communications, 80 percent of battlefield surveillance and reconnaissance, and 100 percent of meterological data, and it did so through all weather conditions. 24 hours a day. Moreover, 98 percent of precision-guided weapons are guided with space-based information. Consequently, the Chinese plan on establishing—and forgive my pronunciation—“zhi tian quan” (otherwise known as “space dominance”). And it has become an essential element for achieving overall information dominance. You see, after Desert Storm, the Chinese were enraptured by the way that we [the United States] sped to victory against what was the fourth largest military in the world. Saddam’s army in ’91 was using relatively modern technology, it was a very sizable force, and it was considered—many were fearful if we went to war in ’91 it would end up being a bloodbath (remember, Saddam was promising the “mother of all battles”). We used space warfare techniques, very early, very premature, but it was space warfare. The Pentagon dubbed Deseret Storm, “America’s First Space War.” Because [General Norman] Schwarzkopf’s famous left hook through the desert was conducted successfully—when everyone said it wouldn’t work in that desert—he took the tanks and flanked, outflanked the Iraqis [in Kuwait]—he did that by relying heavily GPS satellites. And, our reliance on these technologies has only increased. The Chinese were taking copious notes. They were in awe at how effectively outmoded their military was. And, so they went to work, assiduously gathering the techniques, and knowledge, and technology needed to counter the United States. And, this all came to a head in 1996 during the Taiwan Strait Crisis. At the time, it was assumed, I think, by many in China that they could basically push Taiwan around, and at the time time Clinton Administration—which two years before had made a deal with North Korea over their nuclear arsenal—I think many in China assumed (in the government) that they would get a similar deal on Taiwan out of the Clinton Administration. Of course, that was proven wrong. When the Chinese were firing missiles over Taiwan, to try and intimidate [the Taiwanese] from electing a government that China didn’t like. The Clinton Administration sailed two aircraft carriers through the Taiwan Straits, and effectively humiliated the Chinese. It would be akin to China sailing an aircraft carrier group, near-near here in Florida. It was humiliating. And so, at that point, the Chinese doubled down and began a full-throated investment strategy and development strategy, looking at cyber, economic warfare, space warfare, all the goodies—as I say—of modern warfare. Right there, in China, and they have been assiduously building this capability up. Presently, after years of research, the Chinese have created little cube [satellites]. They’re not that big and they’re not that expensive. These cube sats, they’re killer satellites. They’re basically deployed into space. You can deploy hundreds of them from a single rocket. They have grappling claws on them. And, in the event of war between the United States and China, the Chinese have the capability to latch on to our very expensive, very easily targeted satellites—whether it is intelligence satellites, military satellites, or civilian satellites—and they have the ability to physically disrupt the operations of that satellite by literally tearing the insides out. You see, since we lost our manned spaceflight program, we have to rely on the Russians, to launch our people into space, and to conduct—when we can—physical repair or reassessments of certain important satellites. Now, some of our satellites are too far to reach even with a manned space program. But, many of them aren’t. Many of them are in LEO—Low-Earth Orbit. We don’t have that capability. That has withered on the vine. We are trying, it seems like, to get that capability back. But, it’s not that easy. You can’t just flick your wrist and hope it come back. And, the Chinese meanwhile, are very well suited to counter our abilities to defend and repair existing satellite constellations. Something that the Chinese are well aware is in the event of one of our satellites going down—and they tested this in , when the Chinese did a laser attack passing nearby, passing over China—they lazed the satellite with a blinding attack. They shut the satellite down for almost 24-hours. The only way we have to repair a satellite like that is to remotely, in one of the [United States] Air Force bases in the Midwest or the West, is remotely try to remotely access the satellite and restart it. When a satellite is attacked in the way that it was [in 2007 by the Chinese], it tends to shut down its systems, and turn toward the sun, with its solar cells open. Basically, it wants to maintain as much power as it can, but it cannot operate. So, the Chinese don’t even have to destroy the satellite, because they know it takes time for an American ground operator—if he can even get back in touch with that satellite to get it back up-and-running. Now, what can happen in that time? A 48-hour time gap? Well, Ian Watson just wrote a book on that subject. He’s a fellow at Project 2049 which is a think tank in Washington, D.C. that specializes in China. And, he translated a series of pilfered documents from China’s military about the most-updated Chinese plan for invading Taiwan. The Chinese believe that they need a 96-hour window—the penultimate year they keep referring to in the document is 2020—and so the Chinese believe that they could potentially take out Taiwan in a 96-hour period, along the same kind of battle strategy that [the United States] used in ’91, to knock out Saddam in the 100-hour air campaign. And, they want to forcibly reunify. By blinding our satellites that operate over the Pacific—now the Pacific [Ocean] is a vast territory—and so we need those satellites for what’s known as “Over-the-Horizon” communication. By blinding that ability, they basically disconnect our people operating in Asia from the homeland. We are thereby completely caught off-guard, and the ability to respond in a timely fashion to Chinese military aggression is thereby reduced. Now, the assumption—and I think this is a flawed assumption on the part of the Chinese military planners—but their assumption is that, if we, the Chinese, can take Taiwan by force—or through other means—if we can take it in a relatively quick amount of time, and have our forces’ flag flying over Taipei [the capital of Taiwan], the Americans will seek to negotiate. Now, I don’t think that’s an accurate assessment on [the Chinese] part. But this is something that I do know that several people who I know that deal with China there is a contingent of strategists who really believe that. One of the notables is [retired People’s Liberation Army] Colonel Liu Mingfu. He is [Chinese President] Xi Jinping’s unofficial leading strategist. He is the guy who coined the term, “the China Dream.” And the “China Dream” is President Xi’s big push right now. He wants to, basically, he says, it’s “rich nation, strong country” by 2049, which is the 100th year anniversary of the rise to power of the Communist Party. The interesting thing is that it is a very openly militaristic policy. 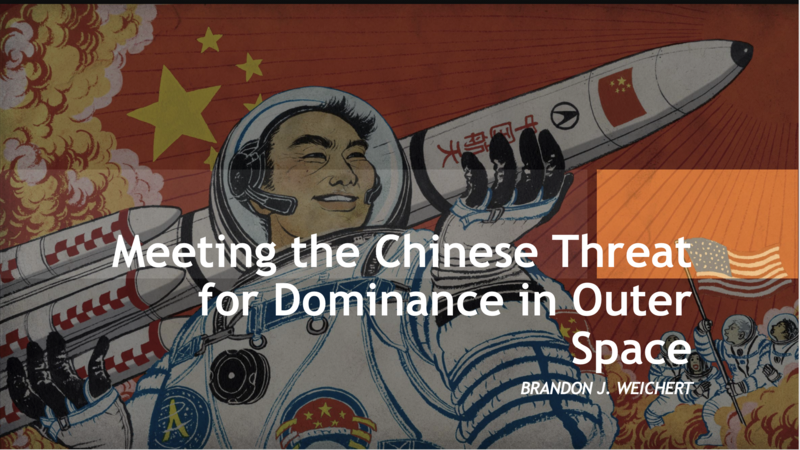 And, the Chinese plan for space dominance plays a supremely important factor in these grand designs for making China a truly global superpower, and potentially, a dominant world power. BW: He wrote a book in 2015, called The Hundred-Year Marathon, and he dissected the works, in part, of Colonel Liu Mingfu, and he is convinced that China has—whether it was an official conspiracy, or whether it was just, kind of, like minds on the Central Committee, over the last—since 1949—that [China’s leaders] have been working assiduously toward a plan of reaching parity first with the United States, which Xi believes he can do in the next few years. Maybe the next decade. And, then eventually toppling the United States as the ba—the world hegemon. And, space again, plays a critical role. In military parlance, it is the ultimate high ground. You control—as I said—if you control low-earth orbit, you basically have the ability to place weapons in space—now I understand there are international treaties supposedly banning this kind of behavior. But, I would remind you all that China is a signatory to the treaties that prevent annexing international water. And, they have been annexing international waters for some period of time. And, so, this is the concern is that the government there may be overreaching and that their policy demands for space may mirror what they’re doing with the [illegal] island building [in the South China Sea]. So, killer satellites are a potential—and the blinding attacks, the antisatellite weapons capabilities—which are basically very easy to build, relatively low-cost missiles that can be launched by either a fighter jet or from the ground, they can track our satellites in orbit—very easy to track our stuff in orbit. We track everyone’s in orbit as well. It’s not a hard capability. In fact, every year, the Russians mock us. They publish the pictures that they take of all of our Lacrosse II intelligence satellites that are supposedly undetectable. And, so they’ve been posting it on Twitter since about 2009-10. So, it’s not that hard to do to track stuff in orbit and either physically knock it out or blind it. And, in that time period, you could have a Chinese breakout capability in terms of what they could take in their near-abroad. The Chinese manned spaceflight program. There is a misconception: many people believe that the world’s spaceflight programs—ours is civilian, NASA, we separated it purposely from the Air Force in the ‘50s and ‘60s—the Chinese actually went the other way. They have reformatted their entire armed forces, and now they have—we all know about the People’s Liberation Army (PLA), the PLAN, the “People’s Liberation Army Navy,” they’ve also now created the People’s Liberation Army Rocket Force. Which, controls their nuclear missiles, their cyber capabilities, as well as space forces. And, the manned spaceflight program is a part of the military in China. I wish we had a powerpoint, because I have a picture of China’s first spacewalk in 2002. A Chinese Taikonaut was pictured, holding a flag—a Chinese flag in space—now, what people don’t know about this incident, it was quite and international SNAFU. The picture was snapped by a cube satellite that the Chinese Taikonaut released with his hand, and it spun around and took a picture of him, but then it did something else, also. It started to take pictures of the American section of the International Space Station (ISS). Which, you’re not supposed to do unless you let the U.S. government know. NASA is part of the ISS, it is a civilian project. But, you are still under international law, required to announce that you’re going to take a picture in space of our stuff. The Chinese did not tell us. We only found this out after the fact. And, the reason is because [the Chinese] are testing their ability to use covert cube sats for surveillance—this was in 2002. They’ve now intensified that capability to making it an offensive, not just a surveillance capability. The [Chinese] manned spaceflight program is also interesting, because—and by the way when I say “manned spaceflight capability,” I’m also including the rovers, the unmanned rovers they’re using on the Moon, the Chang’e-3—it’s currently collecting lunar samples. The Chang’e-4, I believe it’s going to be launched in the next few months. It was supposed to be launched last summer. There was a delay, but now they’re going ahead with it. It was a larger rover. It can last longer. And, it is going to collect samples of the lunar dust, bring it back to Earth for testing. The reason: we know from our own surveys of the Moon in the ‘60s, that the Moon is actually not a dead place. It is abundant in what we know as “rare Earth minerals.” It’s not so rare up there. There’s one thing, in particular, that the Chinese need more than anything to keep their growth going—and that’s access to relatively cheap, relatively limitless energy. And, this is why we see China investing heavily in all sorts of energy, the fossil fuels, but also in the alternative energy sector. Particularly, in the nuclear fusion energy. Now, I know that many people are very skeptical about [nuclear fusion]. But, the Chinese aren’t. And, there’s actually evidence—I mean, if you look at the way that nuclear fusion technology overall has been expanding, it actually mirrors nicely with Moore’s Law for Silicon computer chips, in that it’s exponentially increasing, the capabilities are. The Chinese are big believers in nuclear fusion as long-term, clean, sustainable alternative energy source. There’s the known way of doing nuclear fusion, which is relying on deuterium-tritium reactions. But, there’s actually a more efficient, less radioactive, and therefore less dangerous method, relying on Heliun-3, which is an isotope. It is not found in abundance on Earth, because it is created by solar radiation. And, our atmosphere deflects 80-90 percent of the radiation needed to create Helium-3 on Earth. But, the Moon doesn’t have an atmosphere, and it is suspected that Helium-3 is in abundance on the Moon. A canister of refined Helium-3, it is believed, used for nuclear fusion energy—or to fuel the reaction process-has the potential to provide energy, a canister of about [a foot long] to provide energy for anywhere from 15-20 years, without needing replacement, for a city the size of Manhattan. And, it’s completely clean. Now, this technology is in the early development, and so I don’t want to sound Pollyanna-ish here, but, as we’ve seen with China’s rise in general, big things have small beginnings. And, the Chinese have a very different view—speaking about what JL talked about, about trying to look at the world through the cultural lens of another culture—the Chinese leadership does not view things in electoral cycles the way we do of two-and-four years. They also don’t, on the business side (as we’ve seen with Chinese state owned enterprise), they don’t view things according to the quarterly report or the bottom-line. They view things in a long-count, strategic way. Everything in China is being integrated into the overall Chinese state system. And, so, when it comes to space exploration they are very open about the fact that this is not just for scientific gain. There is no divide in China between a civilian space program and a military one, as exists in the United States. There is a full, integrated effort to dominate space, militarily for the satellite purposes in the near-term. But, in the long-term, the Chinese have every intention of going to space for economic reasons. And, this is critical. Because, obviously, “it’s the economy, stupid!” right? That’s the old saying. So, there’s a geoeconomic component to space that no one really talks about. So, the Chinese century—if that is to be a thing—I think is inextricably linked to space development. Now, I’ve done some work with Silicon Valley, and I’ve kind of seen upfront some of the developments going on out there. Obviously, in the general tech sector, but specifically, in the space sector. But, there is something going on, and this gets back to the integrated nature of statecraft. Because, obviously, with space, space grew—our ability to operate and use space—through predominantly, a kind of, military end. Initially, it grew from rockets—the ability to launch things into space and have it come back and blow up on Earth. And, eventually it evolved from the nuclear discoveries as well. But, the thing about technological innovation is that it’s non-linear. It happens, kind of, in this amorphous soup. And, some things take off and then build off other things, and some things that you think would take off, don’t. And, so, one thing that we’re looking at is the quantum internet. Now, quantum internet relies on space, the Chinese two years ago, and it is still in orbit, and it has passed every test they one—launched a revolutionary new way of communications. It is based on quantum computing technology, which is, the next wave of the computing revolution. And, the Chinese have gotten there first. Now, IBM and a Canadian company is doing the D-Wave. They’re heavily into it for economic reasons. But, the Chinese are into it for strategic reasons, which is why, whereas the American companies are still on the drawing board, researching, China physically deployed this thing and they’re doing live tests, right now. The Micius satellite is orbiting us right now. And, according to KPMG, which is a global consulting firm that deals with the tech sector, heavily, they do their quadrennial tech innovation hub survey, in which they interview anywhere from 800-1,000 leading tech gurus, and they ask them to rank the next top 10 innovation hubs, will it continue to be in the United States? Or, will it go elsewhere? The study from April of 2017 discovered was that, “China is now closing the gap with the United States in leading the development of disruptive technology breakthroughs. These industry leaders also identified Shanghai, not Silicon Valley, as the city that will rival San Francisco, along California’s Silicon Valley, as the world’s leading innovation hub in the next four years. The innovation economy in China is being energized by the technology disruptions that are occurring. What we’ve seen emerge over time is the result of countries and cities striving to replicate and build on Silicon Valley’s tech innovation blueprint, and their increasing degree of success.” This is according to Tim Zanni, he’s the global and US head of KPMG’s tech, media, and telecommunications practice. China is eating our lunch now in the tech innovation—people still talk about Silicon Valley—but, if you listen to people like Peter Thiel, they’re already moving around. I mean, Peter Thiel just moved his operations to L.A., he’s encouraging others to go elsewhere, and the KPMG survey listed Shanghai, Shenzhen, Beijing, and either Guangzhou or Guangdong, there’s a fifth one in there from China. America still has—we’re still in the top ten as well—but it’s really amazing ten years ago, Shanghai looked nothing like it does today. It did not have the kind of investments into the knowledge economy. Remember, we were told in the 90s, “don’t worry, [the Chinese] are just going to take our blue-collar manufacturing jobs—the low-paying stuff—the jobs of last century [The United States] is still going to have a capital on the next-century, knowledge-based industries. That is not true. The Chinese have, for the last fifteen years, really, been transitioning away from manufacturing industrial model—even so slowly, but efficiently—into a more knowledge-based economy, to compete and eventually displace the United States in the 100-year Marathon, economically, politically, and militarily. BW: Okay, yes, they are doubling-down on their investment in a full-throated, People’s Liberation Army-run, 37-hectares (nearly 4 million square feet), $10 billion research center, the National Laboratory for Quantum Information Sciences, it’s going to open in 2020. 2020 is a magical year for many Chinese planners, across the board. They were going to research quantum metrology, build quantum computing for the military and national defense purposes, and then there is $100 billion Softbank vision fund which is scouting for investments in quantum computing and the kind of science being researched by companies such as Google and IBM to succeed current computer processing tech, because we’re reaching the end of Moore’s Law—and even with 3-D computer chips it’s still not enough, because there are heat dissipation problems, and so China has got a leg up on us and they’re doubling-down on this investment. And, with that investment, they were able to develop rather rapidly the quantum internet—very rudimentary, but again, big things have small beginnings—and now, they’re going into quantum radar. Now, [the United States government] just spent over the last decade almost $1.3—with a t—trillion—over the last decade—on the F-35 program. It was billed as America’s “ace-in-the-hole.” The fifth-generation warplane that was the warplane to end all wars. And, for a fraction of the cost, China has developed quantum radar, and they’re marrying it up to Russia’s S-400 air defense battery system, which is capable of hitting our F-35 already, but they’re marrying that system up with—their—quantum radar technology that has the ability to see all existing stealth planes, and they’ve been testing it for about three years now, and, so, for a fraction of the cost not only do they have a way to counter us, but they also are now invested in an innovative way in this quantum computing revolution that will allow the Chinese government—because remember, most industries there are state owned—the Chinese government to dominate the information sector, on the civilian side. The EmDrive, the Electromagnetic Drive—it’s called the “Impossible Drive”—it was developed by Roger Shawyer in 1999 in the UK. Everybody laughed this guy out of the room. So, he sold his design to China in 2007. The Chinese have sunk a masisve amount of money into this project, beginning in ’07 and ’08, and NASA Eagleworks Lab is now hurriedly trying to catch up. But, their system is not as efficient as the Chinese system. An EmDrive-powered ship or satellite could get to Mars in under 10 weeks. That’s just for exploration. Now, if we’re angling to either capture asteroids or to mine to Moon, it takes on a regular rocket about, 72 hours to get from the Earth to the Moon. We could probably get there in a few hours on the EmDrive. The Chinese have a new space station that they put into orbit: the Tiangong-2, or the “Heavenly Palace.” The first one [Tiangong-1] is set to crash into the Earth in the next week, so I hope you’re all insured because we don’t know where it’s going to land—yet. The second one, though, is more stable and more robust. They’re testing a weaponized laser system on the Tiangong-2 as well as the EmDrive. That is something that you’re not going to hear in the press, but I have heard from friends of mine who work for various agencies that the quiet opinion among many people is that, in fact, China is testing the EmDrive currently in orbit. We, as of October 2016—late to the game as always—the UK and US are now investing in a joint venture to try to acquire the EmDrive for military satellites and for potential space planes and other equipment. Again, though, we are about—what?—ten years behind China in this very critical area. Again, [the EmDrive] cuts down costs. So, that’s very important for space. Because, the one thing holding everyone back has been cost. But, now technology is progressing to such a point that cost is becoming a more manageable effort—especially when you look at the potential returns. Speaking about resource scarcity, there have been a series—Brahma Chellaney—is an Indian researcher, he wrote a book called, The Coming Water Wars, and he basically researched from 1947 until 2007, all of the world’s great conflicts, and he found that many of them were centered around places where there was water scarcity. Now, what are we witnessing in the world? Last summer, people don’t realize this, in Doklam, the Chinese and Indians almost went to war over water rights to the Tibetan Plateau. In Egypt, presently, there is a very real potential of a shooting war between the Egyptians, Ethiopians, and Sudanese over water rights to the Nile [River]. So, there is a very serious issue of water scarcity that could be offset—potentially—by the investments we make over the next decade into space mining capabilities. And, toward that end, I don’t know if you’re familiar with a guy Dr. Michael Burry? He was one of the guys who predicted—he shorted the [housing] market in ’08—he’s a very interesting guy. Christian Bale played him in the movie, The Big Short. [Burry] believes that, after having made big bucks off of shorting the [housing] market [in 2008] he now thinks that—if you’ll pardon the expression—water is the next bubble [to pop]. And, we’re already witnessing the geopolitical instability throughout Eurasia in particular because of water scarcity. Investing now in the technology and the economic capabilities to reach space, and begin mining could potentially be a significant help. Insofar as the American response—I’m just going to wrap [the lecture] up in about five minutes—President Trump reconstituted the [White House] Space Council, which was disbanded over the last decade. The Vice-President [Mike Pence] is heading this. It had its first meeting in February. The only real upside that I see with the omnibus spending bill [of 2018] was that it did increase spending for military space operations by 33 percent. But, unfortunately, the Pentagon is fighting this—but I have argued in the press, that we absolutely need a fifth branch of the military: a space corps dedicated solely to space operations. We cannot leave it relegated to the Air Force they are not going to source it properly. They don’t have the long-range vision that China does for space. Some American space weapons that [the Pentagon] is talking about are space-based missile defense, known as “Star Wars,” to help us counteract—I mean, we know from the 1980s—that the technology has finally caught up where we can actually start doing this. The Chinese are investing in it. The Russians are deploying their own system—very rudimentary, but a space-based anti-missile defense system. The Air Force wants to deploy what’s known as “Rods from God,” and this is, giant tungsten rods, with no ordinance whatsoever—they rely solely on gravity. You put them in the strategically higher orbits, and that way when the North Koreans decide they’re going to launch a nuclear missile at Hawaii, well, not only do we have the ability to detect that…we have the ability to launch from space. Our space-based defense systems could intercept that launch and then the [Rods from God] launch from orbit, pummel Pyongyang into next Wednesday, instantaneously. No need to risk a pilot. No need to—we could just do it from space. Space bombing. [The Pentagon] also talk in the Air Force (if you’ll forgive the term) “battle stars.” Which are literally manned satellites. Now, this was the concept the Air Force pushed in the 50s and 60s, known as the Manned Orbital Laboratory. It was ultimately nixed by [President] Nixon on the eve of its launch for various reasons, but had they gone forward with the MOL program, we would have right now an entire ecosystem in space of human capabilities; military capabilities, and I believe we would not be having the threats that we’re having today, but, whatever. So they’re talking about reconstituting some form of this program and putting Air Force or, eventually maybe even, space corps officers—astronauts—aboard these [manned satellites] because we know our enemies don’t mind taking us out if there are no Americans threatened, like China and Russia. But, if American troops are threatened, they’re worried about the crisis of escalation. So, by having Americans on a manned satellite—which could be armed as well—you’re also reducing the potential that there will actually be a shooting war in space. And, then, of course, there’s talk of using cube sats for defensive satellite purposes. Basically, they could be deployed to jump in front of a critical satellite constellation, as a missile is headed toward it, to deflect a missile from it. The problem with [space warfare] is what’s known as the Kessler Syndrome. Which is, basically, when you blow something up in space, you create a sea of debris that moves along at super speeds, and are like little bullets. If anyone has ever seen the Sandra Bullock film, Gravity, you should because it gives great detail [on the Kessler Syndrome]. Basically, [Vladimir] Putin launches an anti-satellite test while our astronauts are in orbit, and it creates this whole crisis, and it takes out the world’s communications—because it creates a ricochet effect where literally [the ASAT test] has a cascading impact on all of the world’s systems. Now, NASA has a way of [potentially] stopping [the Kessler Syndrome]. But, the Obama Administration cut funding. They wanted to put a laser on the ISS and literally use it push the debris out of the way. The Obama Administration was worried that the Chinese were saying that it would constitute as a space weapon, and so there were a lot of diplomatic pushback. I think that we could easily enact that program today, at very low cost. And, I’m probably going to end it there. I’ve got more. But, we can do a Q and A if you want—I don’t know [inaudible]. BARRY SULLIVAN: I think, maybe, you can understand now why characters like me, who, frankly, have very little understanding about what you’ve been talking about are so proud of John’s [Lenczowski] ability to train people at this level. And, I’m unhappy to say that our government is ignorant in a lot of ways about what you’ve been talking about, but, maybe, are starting to learn that catch-up is not just a requirement. It is a necessity. And, I think I’ve told you a couple of stories about the cyber-security and warfare conferences, and as I say, all I can tell you is that the business with Facebook, that has just come out, I don’t think 90 percent of the world understands that there was a way people could use big data and mine all of the information that just goes through Facebook every day—and use it for a purpose. You know? Welcome to the real world, you know? This is going on. And, all I can say is [Brandon Weichert] great and his knowledge is deep and he is not unique [to IWP]. John’s been turning out people like this for some time, starting with a very small base. But, now, we’re at what? 140 students? Something like that? BARRY: The one thing that I want you to remember is that, while Brandon sounds like he’s a military guy, he is not. This government of ours doesn’t put ten cents into this institute. We are totally dependent upon the largesse of our countrymen. Yes, tuitions pay some of the freight. But, these guys are all going to work for government, and I can look at people that have all gone to the fine universities of our country, and made a killing, and have been kind enough to send some of it back to where they learned their trade. The government doesn’t ever pay this kind of thing. And, so, that’s why we’re having this group, you know, John Higgs has been kind enough—and Stephanie Smith—to have John Lenczowski speak here three times, in the last 15-20 years. And, we would love to have much more of a community support [for IWP]. Because, our government isn’t helping these guys at all. They might employ them, but they’re not going to fund them. They’re not going to back them up with capital. And, so, you have to figure out a way to get trained pretty much on your own. BARRY: And, if there are questions, please, feel free to ask them. BW: I’m open to them. Yes sir? AUDIENCE MEMBER: This is going to sound like a ridiculous question, but what keeps you up at night? BW: Well, I have a three year-old and a one year-old at home, so, they pretty much do and, aside from that, the space stuff—if you had asked me that question six months ago, I would have said “our lack of understanding about what’s going on above our heads.” But, today, there have been a series of developments in the last 24 hours that relate to China. China just started trading, yesterday in Shanghai—the Kingdom of Saudi Arabia allowed them—and this is the beginning of a larger (and we talked about this) program to start trading oil, according to the Renminbi—the yuan—and this is the—and [the petroyuan] went gangbusters—everyone basically underestimated how well it would be traded on the global market. And, it is the beginning of China’s final act of displacing the United States. Because, our ability to spend—and this is a bipartisan issue—I think our government spends way too much money. And, they don’t have any way of paying for it. You know, $21 trillion debt, I think it was [former United States Treasury Secretary] Hank Paulsen who said that, in ’08, the Chinese finance minister turned to [Paulsen] and said, “Hank, your country’s debt is the biggest national security threat you face.” And, the dominant position of the dollar—because oil is traded, or was, according to West Texas Futures—is the thing that allowed [the Federal Reserve] to print the money, to allow for all of the spending to go on—now that’s being called into question. And, this is not a blip. The petroyuan is a thing. It is here to stay—unless China collapses—but, I’m moving forward as if that’s not going to happen. Because that is dangerous to assume that. So, that keeps me up at night. Then, my friend just sent me an article before we started—and again, we talked about this at the table—in response to what’s going on with tariffs, and in response to what’s going on with the, I think the nomination of John Bolton [to national security adviser] plays heavily into this—China just conducted their largest naval exercise in history (well, modern history, at least), off the coast of Hainan Island—which is their naval base. The Liaoning—I think that I’m saying that right—their aircraft carrier was part of a flotilla of 40 warships that sailed very close to our two destroyers that are currently conducting Freedom of Navigation Operations. This is part of a larger effort. This is what I was talking about: it’s not just space. You see, we put things into silos—in terms of policies. We look at space is one policy, economics is another policy, political affairs—it’s all integrated! And, so, if you’re asking what my immediate concern is, it’s the economic. Because so much of the damage economically that we experiences (especially since ’08) has been self-inflicted, for the most part. And, our enemies, the old creed, “if you’re enemy is going to kill himself, give him the gun.” The Chinese were more than happy to suborn our egregious spending, when they were helping with our [national] debt, this was all part—I believe—of some loose strategy on the part of senior people in China, the hope, I think on their part, is that we would do exactly what we were doing: do what the Soviets did by spending ourselves into oblivion before China even has fire a shot. This gets back to Sun Tzu. And, that plays heavily into space. Again, because space is really expensive. And, the Chinese are flush with cash right now and they’re investing accordingly—and they’re getting Western firms to invest in them. That’s what keeps me up at night. Yes sir? AUDIENCE MEMBER #2: Are you worried about EMP? JL: Could you please tell them what that means? The EMP commission determined that, in two years of an EMP detonation over the United States, that debilitated anywhere from 80 percent of our capabilities, 90 percent—92 percent—of the population would be either dead or dying in the United States within 2-3 years. Because, it would take about five years to get the infrastructure back up-and-running. That’s not to say that we could do it in that time. Because, as we saw what happened after [Hurricane] Katrina, you’ll have mass riots; you’ll have, like, Mad Max at the Thunder Dome going on, which is going to stall the ability to repair the damage, to say the least. BARRY: Jim Woolsey said to me that most of the people [after an EMP attack] would be starving to death. BARRY: That’s a very critical statement. Next question? AUDIENCE MEMBER #3: You mentioned the [inaudible] and this is a short-term question [inaudible] all of the things that you mentioned that [the Chinese] could do to us [in space] couldn’t we do exactly the same thing to them in exactly the right amount of time? BW: The timing I would argue, again, we thankfully, the one upside of this omnibus bill was the 33 percent increase in military space spending. Why was that much needed? Because for 25 years, we’ve not been sourcing those capabilities. And, so, we are almost back to the drawing board in terms of what we can do. Now, we do have the capabilities. Don’t get me wrong. And, I do think that the current wisdom among the military space policy community, it’s one of deterrence. So, if they launch against us we’re going to launch against them. Here’s the problem with that: there is no country more reliant on space than we are. Now, in the longer-term, China will—like us—become ever more dependent on space. But, presently, the Chinese aren’t threatened when we engage in what’s known as space superiority, which is the deterrence, which is, “hey, eye-for-an-eye.” It’s not an equal paradigm. This is the art of asymmetrical warfare we’re talking about. This is China’s entire stratagem. It’s called “The Assassin’s Mace” strategy. It’s all about uneven fights. The Chinese know that we have more invested and are more reliant on space technology for all things than they are presently. So, in the short-term, the Chinese decide to attack our space assets, first of all, I do think that we could retaliate. But, I don’t think it would have—I think it would have a negligible—or relatively negligible effect on their capabilities. They are still transitioning to a fully modern force that is über-reliant on satellites. And, so, I am skeptical about the efficacy of maintaining a reliance on a response instead of a full-throated dominance model. And, so, yes, we do technically—theoretically—have the ability, but there’s a reason that we’re increasing the spending the way we are, specifically for space. Because we know that there are dire strategic gaps. And the Chinese are filling them quite rapidly. AUDIENCE MEMBER #4: Do we have the capability of shooting down a satellite? BW: Yes, we do. We’ve had that capability since at least the 1989s. Basically, it’s an anti-satellite weapon—it’s basically a glorified cruise missile. And we can launch them—recently, we tested them in 2007, after the Chinese tested theirs. Basically, we have the capability to launch from an Aegis destroyer; we can launch from ground; we can launch them also from the bottom of an F-15, vertically. Again, the problem with that is, the Chinese are not as reliant—they don’t have as many satellites—so we can take out all we want—and we will do damage to them, don’t get me wrong—but the threat to the near-abroad of China would, I think, remain relatively the same. BW: I would hope that we have—I don’t know, I don’t have a classified clearance—I would hope, but I think that when people hear that theory that Woolsey postulated in our government kind of chuckle. But, I don’t because I do think Kim is a Bond villain. And, I do think that he would do something kooky like that. But, we technically have that capability and we do track them, but I don’t know how serious the government takes these threats. You know, we knew, generally, that al Qaeda was coming for us at least three-to-four years before 9/11 actually happened. And, there were people in the CIA, in the government, in the FBI, who were saying “these guys are going to strike.” There’s a great book called, The Looming Tower, it’s not a television—well, it’s on HULU, starring Jeff Daniels, it’s a great book, great series, and it talks about how there were a handful of guys who were involved with the CT—counterterrorism—operation in the 1990s, and no one would take them seriously. And, then they woke up on 9/11, saw what was happening, and J. Cofer Black, George Tenet, all of these guys knew exactly what was going on because they had been tracking it for decades, it’s just that nobody was listening. [With space] it’s the same thing. In 1997, General Hugh Shelton, said in the quadrennial defense review for that year, we are open to a space-based and electronic Pearl Harbor. It was true then, it’s even truer now. Because the capabilities are going in the Chinese favor. And, we just haven’t invested properly. And, the problem is also all of this is based on education and innovation. And that requires time to mature. So, we saw 20 years ago, the Chinese in particular, investing heavily in STEM education programs. That’s science, tech, engineering, and math. They didn’t care about anything else. They were investing heavily in this because they knew this was the stuff of the future. And what are we witnessing today? It is the full flowering of the seeds that were planted 20 and 30 years ago [in education in China]. My friend, David Goldman, who writes for the Asia Times, he was the vice-president—he was one of the VPs at Bank of America for many years, and he was a former Reagan Administration official—who also writes under the pseudonym of Spengler at PJ Media, he talks about how—he has a graph that he loves to show to people during talks—American R&D government, federal R&D spending, has dropped precipitously at the same time that China’s has increased. So, now, we’ve crossed a few years ago. This is a problem. Because the investments that are made today may not pan out for 20 years, but if you make them and maintain them, they will pan out—particularly in tech and innovation. And, relying entirely on the private sector, that’s fine, unfortunately, though, if the private sector had totally been in control of R&D let’s say with nuclear, we might never have had the advent—as terrible as it is—of the nuclear bomb, and the end of the Second World War, at least in the Pacific Theater, was the joint-public-private co-op, that generally worked well. I know that there are excesses [with public-private co-ops]; I know there are problems, it’s not optimal. But, we saw the government fully funding for years Bell Labs. Look at all of the amazing things that came out of Bell Labs. It doesn’t happen anymore. We’re now entirely reliant on the profit and that’s fine, but when you have a system, in America, that is entirely dependent on quarterly reports, you’re not always going to get the big, strategic picture. So, the way that the Chinese view it is, “yes, to get rich is good!” as Deng Xiaoping supposedly said. But, they also look at it from it’s more than just the corporate side—it is a country-side, it is a military-side; it is a full-spectrum. AUDIENCE MEMBER #5: What is DARPA up to? BW: They were involved with that. DARPA, so my wife briefly worked for NIH and her boss was also the head of DARPA. And, the two of them talked, this was back in 2010, and he basically said “don’t go into DARPA if they give you an offer, it’s not what it used to be.” And the reason is because the investment is just not there and what they’re spending their time doing is really, kind of, short-term. A lot of drone stuff—really cool stuff—but, it’s not the kind of next-generation research they used to pioneer (because the money’s not there and the talent is going to the private sector mostly now because it pays better). So, for instance, one of my—the DARPA relies on—or, rather the US government relies on a very specific form of cyber security software that HP—Hewlett-Packard—developed. And it turns out that the big controversy is that they sold—HP, in order to gain contracts in Russia last year—the Russians had one requirement to gain the contract: they wanted access to the protocols for the software system that defends the Pentagon’s networks. And HP sold it to them. And, again, I love capitalism, but sometimes the profit-motive blinds you to larger strategic interests. Well, there’s a great book by Oded Shenkar, he’s a Harvard Business School guy, and he wrote in the book, Copycats, he analyzed how corporations that mimic the innovative corporations, over time, not only beat the innovators, but start to innovate on their own, because they cut down on the time and money that was needed to make the upfront investment by copying it first, and then going off on their own. China is—now, Oded Shenkar would probably say that it doesn’t apply to countries, I think he’s wrong. Oded Shenkar, is, I think, this applies as much to China and also, by the way, it applies to the United States, because remember there was a guy named—last name was, I think it was [Samuel] Slater, he was the father of the American textile factories in 1790s. Who was Slater? Well, over here we know him as the “Father of the American Factory System.” In his homeland of Great Britain, he was known as “Slater the Traitor.” Because he brought advanced textile processes into the former Colonies and he gave them (in exchange for a lot of money and lived well in Rhode Island), he gave them the details—gave our ancestors—the details for the textile factories. And, by the way, those textile factories inspired Eli Whitney’s cotton gin, which completely disrupted the British economy. It did a lot of good. But, imitators, as we’ve proven in the United States, and don’t mistake this: the Chinese learned at our feet. They watched us very closely. Imitators will eventually start to out-innovate the innovator. BARRY: Richard, do you have a question? AUDIENCE MEMBER #6 (RICHARD): Yeah, I wanted to ask you how you regarded the judgment of someone like John Bolton? BW: The judgment, as in his selection [as national security adviser] or as in his judgment? AUDIENCE MEMBER #6: What do you expect from him? BW: Broker. Yes, thank you. But, no, I do think he’s brilliant, personally. I think that he’s a force to be reckoned with. But, my concern is that I want a little less advocacy and a little more honest brokering—get all sides. BW: Right. You can’t kick the can down the road anymore. So, that’s the…what I think the…well, what I think is that we’re actually in a terrible bargaining position. Our allies in South Korea do not want us to escalate. They’re willing to sell their future out to prevent this. I think Kim Jong-un is beholden to an ideology known—well—it’s technically known as “neojuche revivalism.” Basically, his entire legitimacy as a regime rests on reclaiming South Korea. I think it’s pretty clear, that, if you give him any amount of time—he is—all he needs is an [intercontinental ballistic missile, ICBM] that can reach the United States and the game is over. He is about six to 18 months, depending on which [intelligence] agency you talk to. I think it’s closer to six months. He’s six months from having a fully workable ICBM. And then he needs about 16-18 months to mass produce it. So, that is how much time we have left. There is no deal to be made. I mean, we’re really up against a corner. The hope, I think, is that China would step in. They’re not going to. So, we are now, unfortunately in a very terrible position where we are either going to have to attack and suffer the consequences. Or, basically, shrug, and watch as North Korea builds up this capability, and then uses it on South Korea—which it will. They most definitely will. [Kim Jong-un] is not operating in the same reality that other world leaders are. He has increasingly little to lose. AUDIENCE MEMBER #7: What should we do? You’re saying what he would do, I’m saying what we should do…? We’re going to meet with [Kim], Trump’s going to talk—? BW: Well, you have to meet with him. I’m not one of these people who believes you can’t meet—I don’t believe that. I think that they should meet. That’s not a victory [for Kim]. But, I think that we’re going to get very little out of it. There will be more delay and defer. At that point, I do think we should seriously entertain, unfortunately, the military option. Because otherwise we do nothing and—yes? JL: Brandon, may I? I want to answer this question. JL: I have just written a couple of articles on this. And, I think that there are two things we could do: one is we should dramatically increase our missile defense. JL: —launch phase interceptor. So, when [North Korea] doing their ballistic missile that goes [into low-earth orbit], we need to have something [in orbit] in space to shoot this thing down while it is in the launch phase, rather than in its terminal phase. And, so that none of the damage can come over our country. BW: And, if I may piggyback—I’m embarrassed—this is normally, I do talk about this in the other talk that I give, but I didn’t talk about rogue states [in this lecture]. Yeah, the space-based—so—the problem-the problem is time. Money and time. We should’ve been—the minute-the minute that Trump took office—I was very surprised that we were not immediately sending funds over to the military to begin developing this system in space. We are now relegated to ground-based interceptors. There are problems with the ground-based interceptors, as Dr. Lenczowski mentioned, but furthermore, if you think about the physics of it—you’re basically waiting for the missile to reach its terminal velocity, come at you, and then it’s going MIRV (Multiple Independent Reentry Vehicle)—it’s going to split into all of these different, smaller warheads—and that makes it extremely more difficult. So, you’re basically launching up against gravity and you’re having to—like a bullet hitting a bullet—which, by the way, if you don’t destroy the missile fully, you may have radioactive fallout so you could effectively have—if it hits too close to a city—you could effectively have, you know, like a dirty bomb going off then. This is why the space-based system is the only system that will work, and we finally have the technological capabilities we just don’t have the will or the funding to do it. But, the timing is the issue. So, in 6-18 months, unless we can get a Manhattan project for space-based missile defense, we are left with either accepting North Korea’s dominance of the Korean peninsula—and therefore China’s—or we’re going to have to engage in a very devastating military operation that I don’t think any—we can’t afford—and we shouldn’t want. JL: I wanted to mention one other thing—and this is a non-military option—when you go to war against somebody, as Clausewitz counseled, you attack the enemy’s center of gravity, which is that without which the enemy cannot make war. That without which the enemy cannot survive. What is North Korea’s center of gravity? In my view it is its internal security apparatus. It cannot survive, it cannot make war unless it has security. And what does it consist of? Its system of informants, its system of gulag-style prison slave-labor camps, but what is really key to it—and of course that creates an atmosphere of fear—atomizes society. Which means you separate all of the people within a society from one another, leaving the individual alone to contend against the omnipotent state. Then, on top of that, you’ve got the state’s monopoly of communication and information. And that is where they control everything—radio, TV, theater, film, education, publishing, printing, copying, everything—they control paper supply. They—and then—they add to that monopoly of communication and information the propaganda, their ideological propaganda. Which, is like the drumbeat for soldiers marching; it’s the instrument of thought control; it’s the instrument of political correctness; it is the instrument of ultimately speech control, and behavior control. If we—our, our goal—has to be to break that monopoly of information and communication, and that’s why the video broadcasts—why Solzhenitsyn’s argument—about those radio broadcasts as being the most powerful weapon we possessed in the Cold War are so vital. And, that includes television, that includes internet, that includes every method of communication. And, if there is a good signal in there—one way or another—then people, insiders, resisters inside North Korea can try to develop—somehow—an underground line of communication to the West, to us. We have to help them develop that somehow and then they can communicate with their own people. This is what the North Korean defectors recommend. And this is why just a couple of months ago, Kim came out with a list of ten people who are the most wanted people in North Korea; their ten most wanted—or whatever it is—all slated for assassination. Several of these people are involved in international broadcasting into [North] Korea. And, this is about breaking that monopoly. And, ultimately, we did a lot of things in the material sphere to help bring down the Soviet empire, we helped bankrupt them with our military build-up; we denied them our currency by lowering the oil prices, so that they couldn’t earn as much money and couldn’t buy technology; we did technology restrictions, so that they couldn’t acquire this—which we are not doing, we are only beginning to do against China, after 30-40 years of actively helping China become a superpower. Right now, China has access to all of our technologies. They make 5,000 visits a year to our national laboratories, where a visit constitutes a stay of two weeks to two years. We have actively aided China in the development of 10,000 technologies. And that doesn’t count the 50,000 Chinese intelligence collectors in this country—including graduate students at our major universities in the STEM departments, to bring that stuff to China. So, we have a huge task right now to try to break—to-to-to try to destroy the internal security system of the North Korean regime. And that is the way of winning without war; that’s the way. It may take about a decade. But, it was ultimately those capabilities that got a million people to take to the streets in Moscow [in 1991]. Because all of the material stuff we did put pressure on [the Soviets]. But, ultimately, what gave somebody the courage to go demonstrate against the regime when it was a 90 percent certainty that they’d be arrested and sent to the Gulag? Somebody has to be given the courage to do that. And, you have to combat atomization and you have to give people hope. And, by the way, we should be doing the same thing to China. BARRY: I think the club is probably anxious about getting all our lovely bodies out of here so they could get the next group in. But, are there any questions before we wrap this up? BW: Did you have a question? Yes. AUDIENCE MEMBER #8: Well, I just wanted to say “thank you.” It’s been quite a lot of information. BW: Thank you for coming. BW: Sure. And, it’s important to note that China is not a monolithic entity. And, there is no doubt that—particularly among the science community—it’s not necessarily that the Chinese scientists working for these organizations are taking, willingly, in a grand plan to displace the United States. The problem is the knowledge and capabilities that they are able to gain for potentially peaceful purposes, space is a dual-use program. So, what we have for civilian uses and what is, I think it is good, I think, to do some cooperation—particularly in medical, to work together, because God-forbid (this was the basis of [The Martian] with Matt Damon. An American astronaut gets stranded on Mars and it’s actually the Chinese scientists in the movie who try to go around their government to help this fellow scientist). So, we don’t want to close the lines of communication. But, we do always have to be cognizant of the fact that—particularly in a system like China’s—everything is state owned, for the most part. Or, at least the monopoly for sucking up information is state-owned. And, as we’ve seen, the state has a capability to weaponize that information. But, I do think that, yes, there are actual good things that can come out of more cooperation. But, we have to be much more cognizant of the fact that whatever is shared with a country like China can very easily be weaponized by the leadership, by the government. Because, I do know that on the diplomatic corp there are two schools in China that seeks engagement, peacefully, the other [school] is a more nationalistic variant. The peaceful school was pretty much run out of town when President Xi took over by 2012. There is one preeminent proponent of engagement who was President Hu Jintao’s, the last president ,who was his, kind of, chief strategist. He taught at Princeton for many years, but he’ll be the first to tell you—I think his name was Wang, I don’t remember—but he’ll be the first to tell you that he no longer has any influence. And, pretty much anyone who was a part of that school of thought is relegated to just being a talking head; no real influence. And, that’s because there’s been this real hard push—I mean, look at Xi’s background. It’s very militarized. His background is a very military one and he definitely has a favoring toward that side of the spectrum and if you listen to the rhetoric; if you look at what’s going on, everything that can be weaponized is potentially being weaponized in China. But, yes, there are people who are scientists, but unfortunately, a lot of these innocuous sounding things have the capability to leech into an ongoing Chinese military, science research project. Like I said, everything today is integrated, as we’ve never really seen before. It’s one big organism. BARRY: All right, thank you very much.